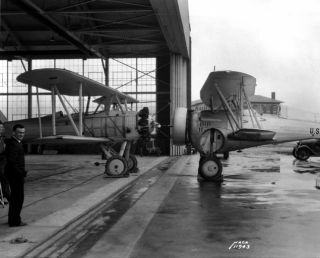 The Curtiss BF2C-1, a failed NACA aircraft, is pictured in a hangar. In this historic photo from the U.S. space agency, on the right is pictured the Curtiss BF2C-1 Goshawk on April 10, 1936. Standing at the hangar door is NACA chief test pilot Melvin Gough. The Goshawk, Curtis model 67A, proved to be a disappointment to the Navy, mainly due to problems with its retractable landing gear and its metal-frame wings.